The police in the Federal Capital Territory, Abuja said they had smashed a gang of armed robbers who had been terrorising residents of the Sauka Federal Housing Area. It was learnt that the robbers, about 30 in number, were operating in the area last week Friday when the police received a distress call, and stormed the area. 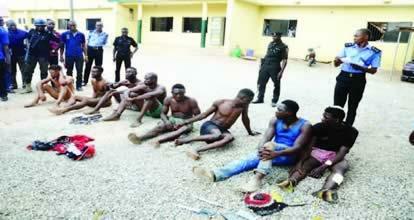 The robbers reportedly engaged the police in a gun battle. Two of the robbers were shot dead while three escaped with gunshot injuries. Three others were, however, arrested. According to the police, items such as a locally-made pistol, nine Plasma Television sets, shoes, and a knife were recovered from them. The spokesmen for the Federal Capital Territory Police Command, Manzah Anjugri, who confirmed the arrest, urged residents to cooperate with the police to rid the FCT of criminal elements.